When dinosaurs walked the Earth, strange bugs lived alongside them – bugs that are still around today.. ‘Jurassic Bugs’ meets these spectacular creatures – wind spiders, camel spiders and whip scorpions – most of which have never been filmed in detail. We move between the present, where scientists study these bizarre creatures, and the distant past, where CGI combined with live action brings to life the bugs that walked with dinosaurs. In an ancient fern forest, a female dinosaur, an Allosaurus, digs out her nest, while in the foreground a pair of whip scorpions perform their beautiful, complex courtship dance, caressing each other with elongated front legs… the female then digs her own nesting burrow right under the Allosaurus nest. 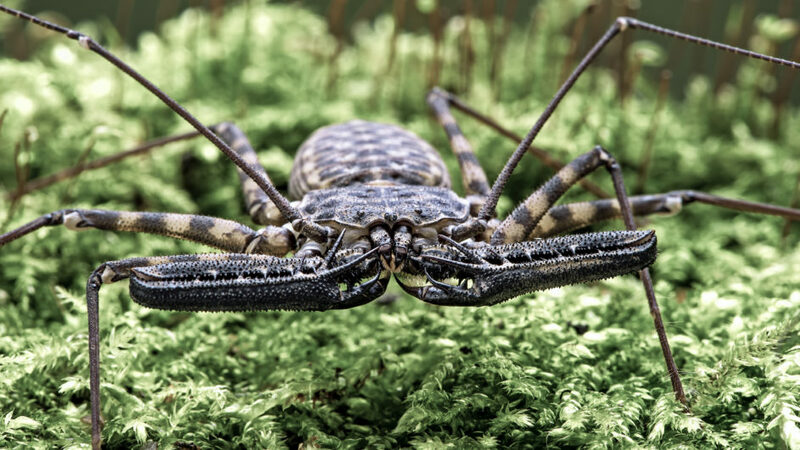 A spectacular 4 inch long whip scorpion – a vinegarroon – is named for the smell of vinegar, a fine mist of acetic acid it sprays at a potential predator. Back in time, it defends itself against a curious young Allosaur hatchling. In Tobago’s rainforests, a giant whip scorpion is fishing – one long pair of legs act like feelers, dangling in the water. When a prawn brushes against its feelers, it strikes down into the water to grab its prey, all revealed by ultra-hi-speed photography. While a Deinonychus dinosaur runs down its prey, a wind spider also relies on speed – moving so fast it looks like thistledown blown across the ground. In ultra-slow motion, a wind scorpion hunts a large cockroach. Its massive, hooked jaws and heads are packed with muscles – huge fangs make up a quarter of its body weight. It just crushes its prey to death, pulps it to mush and slurps up a cockroach consommé. And a species of tailless whip scorpion in the Caribbean eats hummingbirds. Yet whip scorpions are good mothers, carrying their eggs under their abdomens and the young ride on their mother’s back until they are too large. And some species even comfort their young by caressing them with their long feelers. But adult whip scorpions have formidable weapons, so two rivals settle disputes with ritualised dances, escalating to wrestling matches if they are evenly matched. And then, at the end of the Cretaceous, the Earth is shaken and massive volcanic explosions pour dust and gas into the atmosphere. Ash rains onto the fern forest as the giant bugs run for cover – the dinosaurs will never recover from the massive asteroid impact, but for the Jurassic bugs, it’s just another day.